The Squier Vintage Modified Jaguar Bass Special takes a classic, 6-string fender model, and turns it into great bass (albeit a bass with a very long name…) The Fender Jaguar has always been something of a ‘cult’ guitar- picked up by those for whom a Strat or a Tele was just a bit too commonplace. The Jaguar Bass takes the Jaguar’s key elements and adapts them for 4-stringers. The body is the famous, asymmetric design, made from solid basswood. A 3-ply black scratchplate is fitted, which ties-in nicely with the 3-tone sunburst finish. The neck is made from maple, and shaped to a slim, fast ‘C’ profile, with 20-fret rosewood fret board. The pickups equipped here are befitting the ‘Vintage Modified’ name. A single coil Jazz Bass pickup at the middle position and split-coil Precision Bass pickup at the bridge position offer a ‘best-of-both-worlds’ configuration, and a wealth of bass tones, to boot. An active bass boost circuit provides even more low-end weight, whilst individual pick-up volume controls, and a master tone control provide the tools to sculpt your tone endlessly. 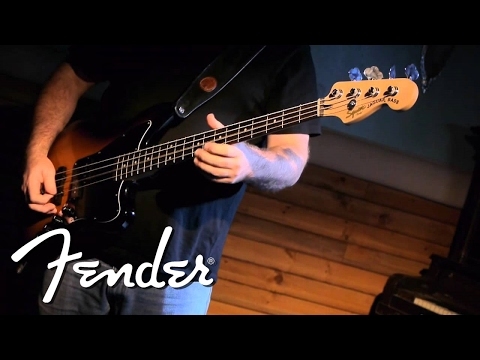 These simple controls combine to make a bass that is capable of a surprising range of tones. A four-saddle standard bridge makes any adjustments straightforward. The Squier Vintage Modified Jaguar Bass Special is a great example of the ethics that underpin the Vintage Modified range. By combining some of the best features from classic, existing designs, Squier has produced a new, exciting bass with a character all its own.